MARSOC just keeps growing and changing. 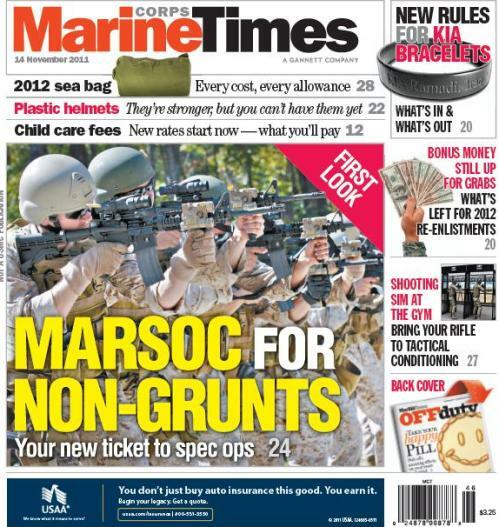 This week’s cover story is a good example of that… a course meant to train combat support and combat service support Marines in the tactics, techniques and procedures they’ll be expected to know when they deploy with MARSOC teams, is also an opportunity for non-grunts to learn some pretty high-speed stuff. During the six-week course at Stone Bay aboard Camp Lejeune, N.C., all students learn to fire a host of weapons, including foreign weapons, and get to do speed reloading and weapons transition drills with an M4 assault rifle and 9 mm pistol. After the course, everyone goes to SERE school, a course usually reserved for special operations Marines, pilots and air crews. And that’s just the obvious stuff. Support Marines are also taken inside the world of special operations with classified briefings on what it’s going to be like working alongside MARSOC’s critical skills operators. In this issue, Marines will also read about the new rules for wearing KIA bracelets and why a stronger — lighter — helmet is taking so long to get to the force. I say awesome….can’t have too many marines with shooting skills…!